Longchenpa (Longchen Rabjampa, 1308-1363) is perhaps the most important philosophical author in the history of the Nyingma school of Tibetan Buddhism and one of the great figures in 14th century Tibet, a time of larger-than-life authors and systematizations of sectarian traditions. Along with Sakya Paṇḍita and Je Tsongkhapa, he is commonly recognized as one of the 3 main manifestations of Mañjuśrī to have taught in Central Tibet. 1) Firstly, he is renowned as the systematiser of the Nyingma tradition of the Great Perfection (Dzogchen), which he expounded in a series of brilliant texts that balanced architectonic structure, aphoristic poetry, and philosophical nuance and precision. While his writings span the earliest phases of Great Perfection literature, he above all else focused on the 11-12th century Seminal Heart (Snying thig (Nyingthik)) revelations and their highly distinctive reinterpretation of the Great Perfection. Longchenpa articulated a deeply systematic approach to Seminal Heart to create one of the most powerful statements of philosophical Vajrayāna. His writings systematize doctrines and contemplative practices into a structured and integrated whole, while simultaneously definitively defining key terminology with innovative nuance. In large part due to the influence of his corpus, the Seminal Heart came to be the dominant tradition of the Great Perfection right into the present. He is famed for his integration of the insights, terminology, and practice of the Great Perfection into the broader framework of an encyclopaedic overview of the entire Buddhist tradition. While many other Nyingma authors appear to have had solid training in the exoteric literature, relatively few wrote at any great length on the subject, preferring to work in esoteric veins and narrative materials. These 3 stand out within the tradition for their great learning in exoteric Buddhist scholasticism, and the expression of that learning in extensive writings. whereby important new bodies of literature were produced as “treasures” (terma) attributed to the distant past of Tibet’s imperial greatness (7-9th centuries) rather than to the authorial hand of the present. Longchenpa’s writings at times utilized the rhetoric of revelation, but in general were clearly presented as his own personal compositions. While certainly such personal compositions had appeared elsewhere in Nyingma circles from the 11-13th centuries, the emergence of such a huge corpus of major religious writings attributed to a contemporary figure was a watershed in the history of the Nyingma tradition. - and finally his return to Tibet and final years in his 50-s.
His studies, social experiences, and literary writings were all deeply interwoven into the fabric of his life, with common motifs and images running through both. Tibetan accounts of the life of a saint begin at starting points that are highly Tibetan and Buddhist in character: past lives and prenatal prophecies concerning birth and life. His most interesting and relevant reincarnational associations, however, are with an obscure visionary from the late 12-13th centuries, Tsultrim Dorje (1291-1317), with intimate associations to the Seminal Heart. Through Tsultrim Dorje, also known as Pema Ledreltsel, he came to be further identified as the direct rebirth of the Tibetan princess Lhacam, daughter of Trisong Detsen (742-797), and a direct disciple of Padmasambhava. Such emanatory identity is common place for great scholars, given Mañjuśrī’s traditional function as the patron bodhisattva of intellectual and monastic pursuits. Samye, Sangphu, and Nomadic Yogis. 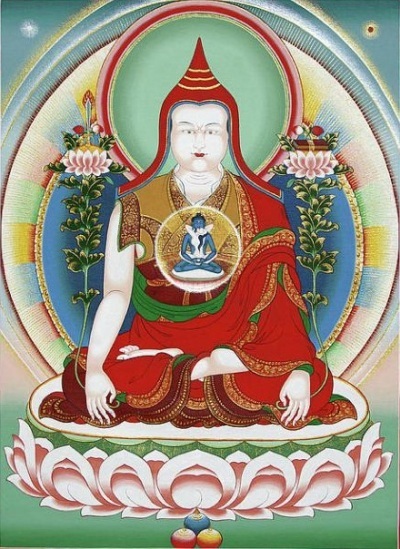 Longchen Rabjampa was born on the Saturday, March 2, 1308. He appears to have been a member of an aristocratic family with strong spiritual associations on both sides of his family, including a paternal ancestor dating back to the imperial period and Padmasambhava’s original circle of disciples, namely Gyalwa Chokyang. It is possible that Longchenpa’s sense of himself as possessing a certain social and spiritual heritage with corresponding entitlements may explain the tensions and self-perception in his adult life discussed below. Longchenpa’s early education consisted of studying various rites, ceremonies, and “sciences” such as medicine and astrology with his father. As a teenager, he memorized lengthy texts, and expanded his interest into the study of Tantric texts from both the ancient (Nyingma) and modern (Sarma) traditions. Longchenpa’s association with Samye dates back to his paternal ancestor, Gyalwa Chokyang, who was one the original monks ordained there in the 8th century. Sangphu, founded by the translator Ngok Lotsawa Loden Sherab (1059-1109), was the preeminent institution for the study of logic and epistemology in Tibet. It was the most important institutional support for the rise of scholastic learning during the 12-13th centuries, and remained a dominant academic seat during Longchenpa’s lifetime. His educational focus thus shifted during this time from ritual and meditation to syllogism and philosophy in the form of works by Asaṅga (c. 315-390), Dignāga (c. 480540), Dharmakīrti (7th century), and others. By all accounts he excelled in his studies, and it was this 7-year stay at Sangphu that gave him the superb mastery of traditional Buddhist thought that came to be a hallmark of his literary output. However, Longchenpa’s decisive educational experience was the period he spent living and practicing with his principal teacher Rigdzin Kumaradza (1266-1343) during his late twenties. The biographical materials mention that Kumaradza and his small band of disciples wandered from place to place, living like virtual nomads, exposed to the elements, living and sleeping in crude sack garments. Such a yogic lifestyle stands in clear contrast to the institutional life of so many Tibetan scholars based in large monasteries, presiding over systematic institutional processes, and often bound up with or even directly wielding political power. This quasi-nomadic lifestyle is also consonant with tropes and metaphors commonly found in Great Perfection literature valorising space, the absence of boundaries, natural freedom, simplicity, and spontaneity. Hence, this training with his teacher Kumaradza may be understood as a period during which these literary images became associated with vivid sociological experiences connected to specific behaviours and lifestyles for Longchenpa. Longchenpa is said to have been designated as his successor, after which he embarked on a period of intensive teaching and meditation. Thus, during his 30-s, Longchenpa emerged as a teacher in his own right and began to pen some of his greatest works. Although Longchenpa’s fame as a practitioner and teacher were increasing significantly during this time, he never founded or became affiliated in any significant way with a large religious institution. On the contrary, he apparently preferred the relatively remote hermitage setting of his home monastery called White-Skull Mountain: It was here that he composed many of his greatest works. The most famous is undoubtedly The Seven Treasures, which integrates standard scholasticism with philosophical poetry to offer a systematic survey of Buddhist thought and practice from its earliest phases up to and including the distinctive synthesis of the Seminal Heart. These 7 texts as a set are famous among his fellow Nyingma, as well as other sects, for their philosophical acumen, their systematization of the Great Perfection, and their ability to integrate distinctive Nyingma esoteric traditions with pan-sectarian Buddhist scholastic traditions. The Wish-Fulfilling Treasury and The Treasury of Philosophical Systems focus on the basic Buddhist scholastic systems with modest influence from the Great Perfection. In contrast, The Treasury of Words and Meanings and The Treasury of the Supreme Vehicle offer a scholastic treatment of the Seminal Heart in its own right. Finally, The Treasury of Reality’s Expanse and The Treasury of Abiding Reality constitute masterpieces of philosophical poetry focused on the Seminal Heart, while The Treasury of Esoteric Precepts is a lesser work devoted to lists of precepts. The Trilogy of Resting-at-Ease and The Trilogy of Natural Freedom are both lovely root poems around which a variety of other commentarial texts have been associated, all of which centre around earlier traditions of the Great Perfection known as “mind series”. These constitute his ritual and yogic masterpieces of the Seminal Heart, in addition to detailed discussions of many other aspects of the tradition. These were integrated with 2 similar compilations deriving from the older revelations associated with the Indian saint Vimalamitra (8th century), and the more recent revelations associated with the Indian saint Padmasambhava to form The Seminal Heart in Four Parts (though in fact it has 5 parts). Thus this famous anthology compiles the 2 main strands of exegetical literature of the tradition along with Longchenpa’s extension and integration. Finally, The Trilogy of Dispelling Darkness was his masterly commentary on The Nucleus of Mystery Tantra (Guhya garbha tantra), the chief Tantra of the Nyingma tradition and the centre of the Mahā Yoga corpus. This trilogy was famed not only for its detailed study of the Tantra, but also for its innovative Great Perfection-based reinterpretation of many of its particulars. Longchenpa wrote widely on many other topics, including exoteric Buddhist scholasticism. However, it appears that the vast majority of these compositions have been lost to the ravages of time and the relative lack of concern for exoteric writings by the Nyingma tradition in pre-modern times. Longchenpa had a lifelong tendency to remain somewhat in the margins of religious institutions and political powers, and yet he was also explicitly critical of social, political, and religious trends and events in Tibet. We have already seen such tendencies in his nomadic years with his teacher Kumaradza, and his proclivity for the isolated retreat centre of White-Skull Mountain. For example, toward the end of his stay at Sangphu, we can see Longchenpa’s impatience with what he perceived to be the frivolous behaviour of ostensibly religious figures. This bitter but witty work is a savage attack on the dubious conduct of the persons in question, likening them to demons and accusing them of such actions as killing, boozing, and whoring. The Sakya hegemony, together with its Yuan dynasty patrons, was reaching a state of collapse. Religious and regional factions were in open and often violent conflict. Central Tibet in particular was a contested area, with sites like Samye coming under the control of belligerent factions allied with specific clans and religious sects. Families, politics, and religion were inextricably interwoven throughout the time. Among the prominent competing factions active in Central Tibet at that time were the Sakyapas, the Drigungpas, and the Phagmodrupas, whose leader was Tai Situ Changchub Gyaltsen, 1303-1364). - as he entered a period of political turmoil and even exile during his 40-s. The plots of several of these narratives revolve around the protagonist - invariably an exalted spiritual personality - being set upon by irreligious forces and being compelled to depart for regions more conducive to religious practice. These stories all take the appearance of a subtle social critique, and convey the impression of being thinly veiled autobiography. In this work, Longchenpa’s perception of himself as an unjustly ostracized pariah is clearly evident, and the references to his specific situation are more explicit than in other examples. The Swan in the story is in reality an emanation of the Bodhisattva Avalokiteśvara, and is clearly patterned on Longchenpa himself. Among the more prominent of the competing groups were the religious factions of the Sakyapas and the Drigungpas. Longchenpa, while no fan of the increasing military presence in Central Tibet, became implicated in a bitter feud between the leader of the Drigungpas and the leader of the Phagmodrupas, that is, Changchub Gyaltsen. Changchub Gyaltsen reportedly came to view Longchenpa as a significant enemy, to the extent that he tried to have him assassinated. This conflict, together with all his other frustrations and disappointments, eventually led Longchenpa to flee to Bhutan in approximately 1353. Longchenpa was reportedly very active during his time in Bhutan, establishing and renovating many monasteries and retreat facilities. He taught widely, and is credited with reviving the fortunes of the Nyingma and Great Perfection traditions in that region. He composed several important texts there, very likely including The Treasury of Abiding Reality. His home base was the famous Tharpa Ling monastery, still standing today in Bumthang. He also fathered at least one son with a nun during his stay in Bhutan, indicating that his monastic vows either lapsed at some point or that he viewed his realization as enabling the integration of monastic vows and sexual activity. Eventually, reconciliation between Longchenpa and Changchub Gyaltsen was negotiated, such that Changchub Gyaltsen invited Longchenpa to return to Tibet, made offerings to him, and received Tantric initiations and other teachings from him. In fact, there is a tradition that Longchenpa’s most famous epithet (Longchen Rabjampa, “infinite open space”) was given to him by Changchub Gyaltsen himself, although the veracity of this story is uncertain. Although we have no definite dates for Longchenpa’s sojourn in Bhutan, it may have lasted from roughly 1353 to 1360. In 1363, when he was 56 years old, Longchenpa became sick, and began to prepare for his eventual passing by composing his final testaments. Finally, late in that same year, Longchenpa had a series of visions and gave his final advice to his disciples. His hagiographies describe his death in terms typical for a saint, specifying that he entered a state of deep meditation, and manifested many miraculous signs such as rainbows, earthquakes, and showers of flowers in his final hours and for 25 days following his death. but a useful 4-fold measure is to consider the institutional, literary, intellectual, incarnational, and visionary impact a figure has after his death. He offered no new institutional models, his disciples were not particularly vigorous in founding new monasteries and temples, and his institutional legacy was limited to modest sites such as the retreat centre White-Skull Mountain and the temple in Bumthang. It appears that a family lineage did persist over the centuries in Bhutan from his offspring there. Longchenpa’s most significant contribution is undoubtedly in the intellectual and literary domains, where he is a towering figure historically both within the Nyingma tradition and outside it in other traditions. Curiously, however, he did not spawn a cottage industry in exegetical literature directly commenting on his work, quite in contrast to many of the other great Tibetan philosophical authors. 1) Firstly, Longchenpa’s impressive range of scholarly expertise and philosophical nuance in the exoteric traditions remained unusual in Nyingma traditions until the last few centuries. 2) Secondly, on-going revelation remained a dominant influence in subsequence centuries among Nyingma lineages, and its historical focus on the imperial past discouraged the development of exegesis of post-imperial Tibetan authors. Despite this absence of direct commentarial literature, Longchenpa’s influence was pervasive, even if mediated through vision and the explicit citation often thus sublimated. His impact on Great Perfection traditions can already be seen in the revelations of Rinzin Godem (1337-1409), or in the later revelations of Jigme Lingpa (1729-1798). which undergirds much of the Eastern Tibetan ecumenical movement, and forms the most important basis for the modern monastic curriculum of Nyingma institutions. Over time Longchenpa thus achieved renown within and without the Nyingma tradition as its greatest intellectual. Incarnational lines known as “Tulku”, literally “emanated bodies,” of course refer to the phenomenon in Tibet of religious personages being identified after death in young children believed to be their rebirths, and to whom the previous life’s title, position, and property were transmitted. This institution of cross-life inheritance was naturally bound up with monastic institutions, which had the institutional resources, memory, and record keeping to maintain such incarnational lines. Longchenpa’s failure to found his own large monastic institution almost guaranteed the lack of such an incarnational heritage. but none of these crystallized into a high-profile and continuous series of incarnations in the way of, say, the Karmapa or Dalai Lama incarnational lines. In contrast, Longchenpa has had a highly successful visionary career since his death, and his presence in visions and dreams has become a pervasive feature among Nyingma scholars and yogis. and while perhaps subliminal, the use of the term Longchen in its title is obviously deeply resonant of Longchenpa’s own centrality in the tradition overall.